So you want to look more professional on social media networks ey? I don’t blame you for one minute. I guess you can say that I was a bit of a skeptic…until I found out that nearly 1.79 billion people that are active on social media. After I read this stat and started getting some traction from social media for my brand, I decided it was time to start taking social serious. You’re already active on social media platforms but want to find more ways to stand out from others competing in your space. Either way, this article will uncover 10 actions you can take to look more professional on social media networks. You ever hear of the term “first impressions are lasting impressions”? Your social media profiles are no exception. Let’s say that someone connected with you via your social media channels and they wanted to get to know more about your business. They scurried over to your Twitter profile to start looking around and saw the dreaded “Egg” picture, with a profile filled with meaningless Hashtags and nothing else. Do you think that this is going to make a good first impression on them? What I’ve learned from using social media for my biz is that people want to connect with people and that you want to make sure that you add a personable touch to your profiles and make a “human” connection with your peeps. I Used to Think that Using Social Media for My Biz Was a WASTE of Time…..
Its true! I didnt put much stock into social media for marketing purposes yall..(just keeping it real here). I just figured, oh hey, I’ll just create a profile, post content from my blog and (maybe someone might read it). One day, after signing up for a Twitter account, my perception of social media changed. What happened next totally Blew.Me.Away. A columnist from the New York Times (yep you read that correctly) — had actually retweeted one of my posts out to all of his followers!!!! (60 thousand) of them to be exact! And best of all, guess how much it cost me? Absolutely zero in marketing dollars. That my friends is the sheer power of having a social media presence + sharing content on there. Just as in “real-life” you are judged by your appearance online. When someone lands on your social media accounts, you want to give the absolute BEST first impression possible. NOTE: Oh and for you visual peeps, here is a nifty embedded presentation that the folks over at Canva put together that features a list of these tips! We would love for you to share it with your peeps on social media! Just as in “real-life” you are judged by your appearance online. Ss in your first and last name to all of your profiles. You don’t want to add any nicknames (BookyBear or HotChick81) — that does not read professional at all. Besides, adding your name to your social media profiles makes it easier for people looking for you to find you. 2. Add a professional photo of yourself. As stated initially, my guess is that you are planning to use social media for your small business. As such, it would behoove you to add a professional photo of yourself to all of your profiles. Well for several reasons: brand consistency and also for brand recognition. Besides, think of this way: if a business associate or a potential client were to view your photo, would they be turned off or would they want to learn more about your business? The picture below is the one that I use for all of my social media profiles…. 3. Create a username that accurately represents your brand. Your username should be closely tied to your brand /small business name. This makes it easy for people to find you under your business name — in case they are not able to locate you by name. You should also use the same username or variation of that username on all of your social media profiles — again for brand consistency. 4. Add a brand statement to your social media profiles + use it consistently. I have to be honest here, I didn’t fully understand the importance of creating a consistent brand statement on all of my active social media profiles, but now I do. Your brand statement or mini bio just simply states what you do and who you do it for. >> Your Action Item: Create a brand statement/tagline that describes what you do and who you do it for. Add it to all of your social media profiles. 5. Create branded social media profile covers. Again, for brand consistency and a professional and polished look online, it is a good idea to invest in having professional covers created for your social media profiles. If you don’t have a ton of money to spend or any graphic design experience, you can use a free resource like Canva or enlist the graphic design expertise from designers on Fiverr to create your covers for your business. 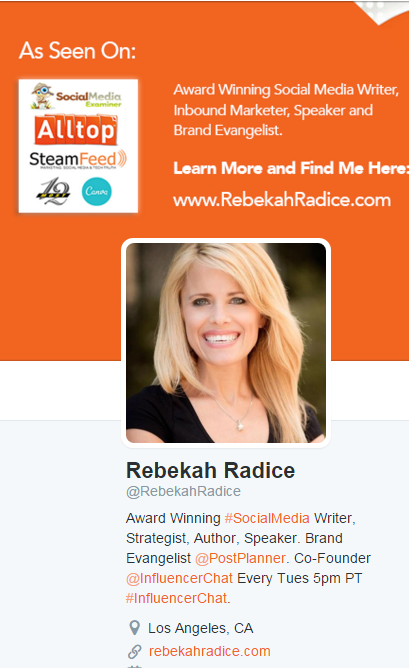 >>> Your Action Item: Create branded profile covers for all of your social networks. 6. Use the correct dimensions for all of your social media profile covers. From cover photos to profile images, every social network has specific requirements and guidelines that you will need to follow. However, the thing I love about using Canva is that they design templates that you can use with all of the correct dimensions and sizes for all of the major social networks. >>> Your Action Item: Make sure that you are using all of the correct sizes and dimensions for all of your profile covers. 7. Add links to your website or blog on all of your profiles. To drive traffic and visitors back to your website, blog — or for that matter any page that you want people to see, you should add the appropriate URL to all of your social profiles. 8. Use Relevant Hashtags related to your industry on your profiles. When you optimize your profiles, content, and updates with hashtags, they become more visible to others on social media platforms..
As an example, if you are a Small Business Coach, you could use #SmallBusiness Coach in your brand statements, bio’s and even content. >>> Your Action Item: Search for relevant hashtags in your industry, and add them to your social media profiles. Again, this goes back to creating a consistent brand across all of your social media profiles. 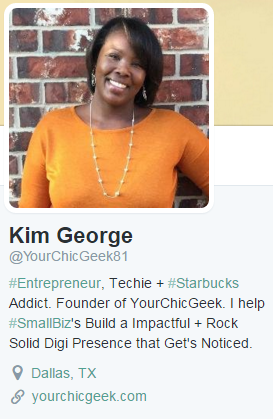 As an example, my brand is YourChicGeek, so I have setup the majority of all of my social media profiles and have added YourChicGeek in the URL’s or some variation of it. 10. Make sure that your profile can be viewed publicly. So you’ve done all of the work to get your profiles set up on social media, now you it’s time to go live! You will need to check make sure that your privacy settings are set to allow folks to view information about you and your business. Please be aware that these settings will vary from site to site, but nevertheless, it is very important to make sure they are set correctly. >>> Your Action Item: Check your privacy settings on all of your social profiles to make sure that they are setup correctly. Alrighty peeps, over to you. Are there any additional tips that you would like to share for looking more professional on social media? 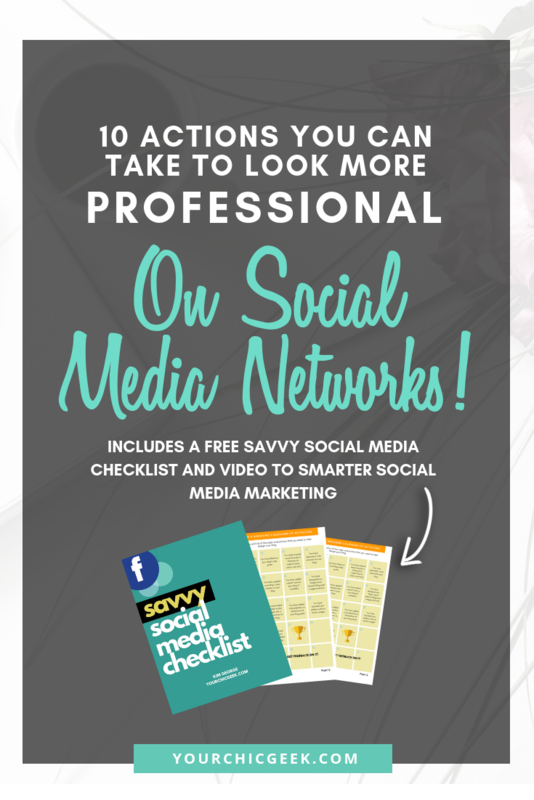 I am so loving this 10 Steps to a Better Social Media Profile Checklist from @YourChicGeek81. 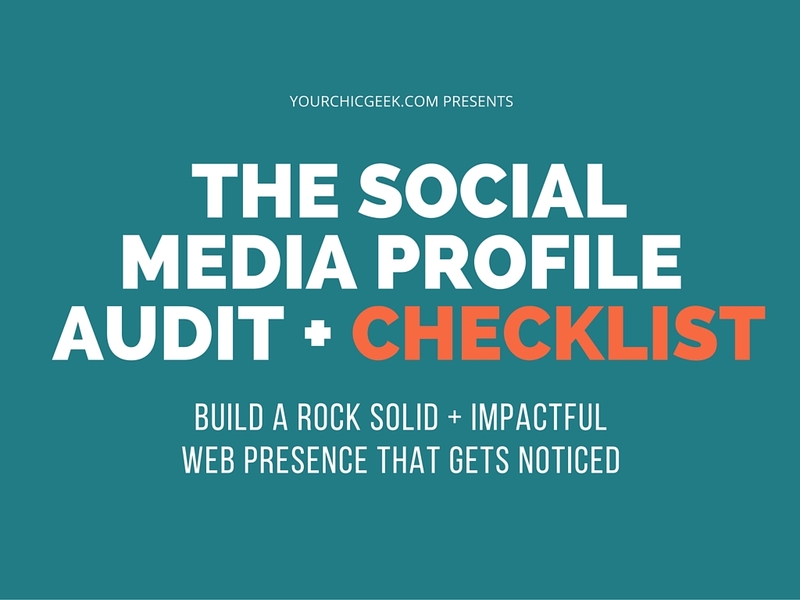 BONUS CHECKLIST: Brand + Create your social media profiles like a PRO with this 10 Step Checklist. Click here to Download the Checklist now. Enter your name and email address to get this 10 step checklist sent straight to your inbox!